(CNN) -- Hundreds of thousands of small oil wells in the United Sates, called "stripper wells," are being touted as part of the solution to dependency on foreign oil. CNN's Abbie Boudreau examines a stripper well in Bradford, Pennsylvania. Small, independent oil producers tell CNN most people don't even know they exist. "That's part of our message -- to let the public realize we are not the Exxons and the Mobils," said Fred Fesenmyer of Minard Run Oil, a Bradford, Pennsylvania, company that has been in his family for six generations. "I think we're a huge part of the solution." These wells are scattered throughout the country. 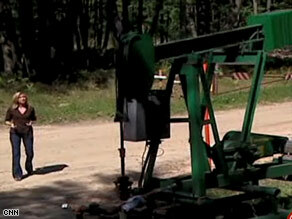 Stripper wells are marginal, low-volume wells that produce less than 10 barrels of oil per day. Finding new sources of energy has been a recurring issue in the presidential campaign. John McCain touts offshore drilling as a solution to producing more oil, and recently held a press conference on an oil rig in the Gulf of Mexico to make his point. Barack Obama says renewable energies are the only way America will achieve energy independence and his plan would invest $150 billion over the next 10 years to encourage the development of alternative energy. "Small oil" advocates like Fesenmyer say there's a significant amount of domestic oil potential that remains untapped. "We still feel that there's about 50 percent of the oil still left in place. You're not going to recover every drop of it, but technology will help us recover a lot more," Fesenmyer said. "It's like squeezing a sponge. You can squeeze it by hand, but if you put it in a wringer, you're going to get some more out of it. So, what we're trying to do is come up with new technology that will allow us to extract more oil from the same area that we're extracting it now." The Stripper Well Consortium provides funding for the development of new technologies to help stripper well producers operate more efficiently and extend the life of old wells. Stripper wells produce about 335 million barrels of oil each year, according to the consortium. The group says that if each stripper well could produce one more barrel of oil per well per month, that would be equal to two super-tankers of oil imports each year. "If we have 50 to 60 percent of the oil still left in the ground, why can't we develop better technologies to get that out?" said Joel Morrison, director of the consortium. One project currently being tested is the GOAL Petro Pump. The manufacturers of the pump, Brandywine Energy and Development Company, say some of their clients have seen a 100 to 300 hundred percent increase in production since its installation. The new technology uses the natural pressure of the well to extract more oil and gas and uses no electricity. The manufacturers say the pump can operate on as little as 12 to 15 pounds of differential pressure, which allows it work on very old wells. Other technologies currently being developed are aimed at increasing production by decreasing maintenance and operational costs. For now, Morrison says too much oil in these old fields just sits in the ground, untapped. "Wouldn't it be great if we could take a well that's producing two barrels a day and make it up to five barrels a day?" he said. "We don't even have to drill for more. Let's just use technology to get more of that oil out of the ground. It's an existing well. The footprint is already there."